Scotland Under-21 winger Peter Canero is poised to sign for Leicester, with Kilmarnock fuming at the size of the transfer fee. Killie had been pleased with an initial offer of £350,000 for the 22-year-old, who is out of contract in the summer. But they were forced to accept £100,000 less once agent Raymond Sparkes became involved in negotiations. Kille general manager Dave MacKinnon said: "Kilmarnock are not going to get as much money as we thought." 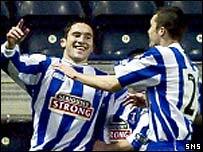 Canero had rejected Killie's offer of a new three-year deal and a 60% pay rise. Instead, he travelled to Leicester with Sparkes for talks and a medical on Wednesday. He is expected to take in his new club's FA Cup tie with Manchester City before signing talks the following morning. "Kilmarnock and Leicester City have behaved impeccably, as has the player, who has acted professionally throughout," MacKinnon told the Daily Record. "But, once other parties outwith those three entities became involved, the problems started." However, MacKinnon was pleased that Kilmarnock will receive some money for a player they could lose for nothing at the end of the season. "Peter will go down there to discuss terms and he'll take in the FA Cup replay with Manchester City," he said. "Given the player's contractual situation, Kilmarnock are delighted with the offer we have had and hopefully the player and his agent will be able to negotiate a satisfactory package for Peter. "I think it is a great move for him. But if Peter decides it is not for him at Leicester then he is more than welcome to come back to Kilmarnock and sign for us."